Lovely 3-4 rooms renovated in 2014 about 80 m2 in the countryside with views of the castle from the 18th and Park. Including a living / dining room with exposed stone with fireplace and kitchen on the ground floor; and upstairs two bedrooms (one large and beautiful maid room) and an adjoining office-hall, with bathroom and toilet. In a family estate, two gîtes of character - to rent together or separately - located in an outbuilding of the castle of the eighteenth century overlooking the castle and its park. 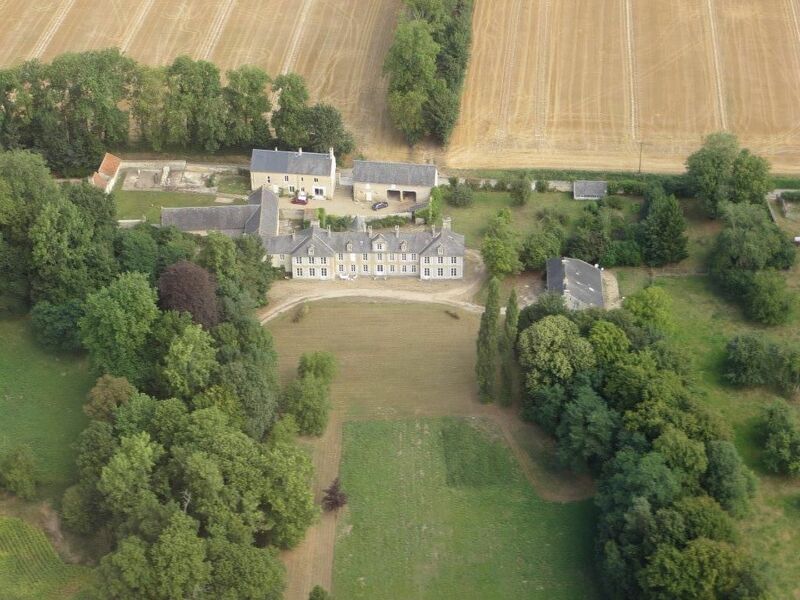 The property is quietly located in the countryside, ideally located 2 km from the castle of Audrieu and 12 km from Bayeux to discover the battlefields and the landing beaches as well as the historical past of Normandy. The two gites are spacious. Le Petit gîte or 'Maison Stéphanie' is 80 m2 for 5 people (possibility of 6 on request); It comprises on the ground floor a beautiful living room with open plan kitchen; It comprises on the first floor a very nice room of 17 m2, a more modest room which can be either a children's room or a room of cleaning (two singles modulables), and an antechamber / office. The large gîte or 'Maison Véronique' is 120 m2 for 8 people (possibility of 9 on request); It comprises on the ground floor a large corner living room, a separate dining room, a separate kitchen and a back kitchen as well as a bathroom / WC . ; It comprises on the first floor four double bedrooms, an anteroom / study and a bathroom with toilet. The two gites, whose living rooms are in stone, each have an old fireplace. Heating is provided by two separate oil-fired boilers. In season you can sit outside and have lunch. No problem parking his car. -Participation household to / f. stay: 45 €; - Linen provided: package 10 € / pers. Optional services available on request. Nous avons été très heureux de vous accueillir avec votre famille . Votre séjour s’est très bien passé et vous avez pu ainsi découvrir notre belle région. En raison de votre réservation automatique pour la semaine du 15 août, le ménage de la pièce de séjour (pierres apparentes) n’a pu être fait aussi bien que d’habitude. Il s’agit d’une maison ancienne (dans un ensemble du 18ème siècle )-récemment rénovée mais qui demeure champêtre dans un site hors du commun. Gite charmant, très calme et pittoresque, très bonne situation pour rayonner dans la région. L'emplcement du gîte est trés favourable pour visiter la basse Normandie et le context natural trés agreable. Les proprietaires sont vraiment amaibles. Malheureusement la propreté du gìte est absoloutement inadèquat, beaucoup des airagnée et poudre partout. L'equipement de la cuisine peut être ameliorè. En complèxe un petit trop sauvage, surtout en comparaison au prix payè. What a peaceful place and what a wonderful people. A truly memorable holiday. For us a good location for activities with plenty to do all within an 1,5 hour drive. A trip to Honfleur and Le Mount le Saint Michel is a absolute must. All the Normandy beaches are easily accessible. Bayeaux is also a nice town to visit. Next to the manor house where the owner lives there are two cottages for rent. The owners are very hospitable. We stayed in the Petit gîte. Our cottage is renovated, authentically decorated, has two bedrooms and accommodates up to 6 persons in charmingly furnished and maintained rooms. The atmosphere throughout is exceptionally pleasant and harmonious, and contributed greatly to the well-being of all of us. II have expressed my enthusiasm to friends about the place and its possibilities. We look back on a perfect holiday. The region is that of the D-Day beaches 1944: Utah, Omaha, Gold, Juno and Sword; with many monuments and museums (including the Caen Memorial, the Museum of Arromanches, etc.). Military cemeteries (American, British, and German) are worth visiting. The region is also that of William the Conqueror, with the pretty little town of Bayeux (Queen Mathilde Tapestry, old houses), Caen (Abbeys and Castle), etc. The gastronomic reputation of the region is well established.